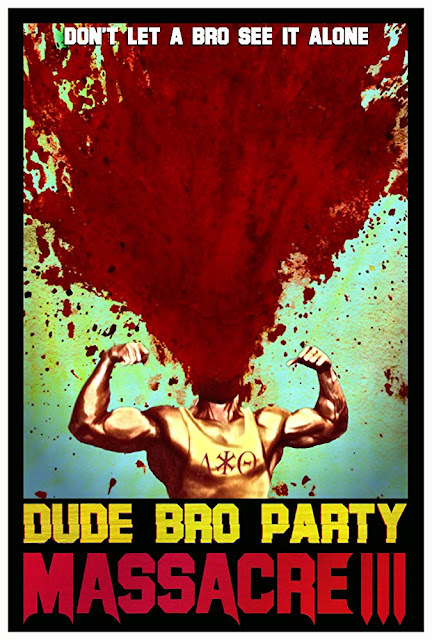 Movie: "Dude Bro Party Massacre III"
A college student joins a rowdy fraternity that has been plagued by a serial killer on two separate occasions to investigate the murder of his twin brother, which has set off the third string of killings. Can you call something a "bad movie" if filmmakers set out to make something that looks like a bad movie, has intentionally bad performances, and intentionally bad writing from the get-go? If it looks bad, sounds bad, and is performed poorly, technically, these filmmakers were successful in achieving their goal. "Dude Bro Party Massacre III" has three directors, Tomm Jacobsen, Michael Rousselet, and Joe Salmon, all of whom are making their feature film debut here. The story has 10 writers (including the three directors), who all act in this movie as well. The final screenplay was written by Alex Owen, who also stars as the movie's protagonist Brent Chirino and his twin brother Brock. At the beginning of the story, the audience learns that, in the previous two "Dude Bro Party Massacre" films (which don't actually exist), the fraternity called Delta Bi Theta has been tormented by a murderer named Motherface. Brock is one of the few people to survive the first two movies and is usually the one who stops Motherface...not this time, however: he is killed off in the first few minutes. Brent, who is typically the loner of the two twins, decides to join Delta Bi Theta so he can investigate Brock's murder and stop this crazy killer once and for all. This movie is presented as a banned film from the 1980's. The last existing copy is one some dude had recorded off the television and onto a VHS tape, complete with tracking problems like the ones you'd find on a worn out VHS, as well as commercial interruptions from said TV recording. Pretty awesome, right? As we said earlier, this film is made to be cheesy. The dialogue is terrible, the story is ridiculous, and the acting is outrageously over-the-top. It's all part of the kitschy charm of "Dude Bro Party Massacre III." From the beginning, this film sets out to be a "so bad it's good" 80's-style slasher flick, and for the most part, it is very successful in that task. Usually, movies that are so bad they're good are happy accidents that happen when a movie has a limited budget and inexperienced actors playing out a silly premise. The group of guys who made this knew that's what they had and fully went with it. It may sound simple, but making a good bad movie isn't as easy as it sounds. We have seen many filmmakers try to purposefully create movies that try to capture the unintentional comedy gold found in projects like "The Room" or "Troll 2," but usually, they fail miserably. "Dude Bro Party III" flourishes with its goofy genre cliches and will make you laugh because of how terrible it is. Maybe it helps that they got Greg Sestero to play one of the frat guys, which really adds something extra special to this flick. We laughed a ton while watching this and loved the extravagant, unnecessary gore factor and horror movie tropes as well. "Dude Bro Party Massacre III" is really quite the experience. It wound up being very enjoyable for us. With cameos from Patton Oswalt, Larry King, Andrew W.K., and Olivia Taylor Dudley, you really can't go wrong with this creative-but-trashy horror film.